I really loved Soo’s unstitched coats. Each time he was wearing one, I noticed the details -in this case, the lack of stitches. I always wondered if it was intentional. The collars and lapels were left free and loose. It’s like his choice of clothing is speaking for him – that he values his freedom and doesn’t like to be restrained and controlled. It reflects his personality too – free spirited, unpredictable, and impulsive. He wore one on the first episode when he went to visit where Oh Soo’s ashes were scattered -maybe to show how lost and unglued he felt. He also wore one when he beat up that corrupt doctor who allowed Young to go blind cuz he was unleashing his pent up anger. Then he wore one on the trip to the cabin with Young cuz this was the point in their relationship where the truth was going to be laid on the table and neither one knew what would unfold. Sometimes stylists like to contribute to a scene by what they choose for the characters to wear. It worked like a charm in this drama cuz every time I see him wearing those coats, I’m reminded again of the kind of person Soo was. It’s like every stitch that was left to stand alone meant something. His life was coming undone until he met Young. She put the unraveled pieces in place and made him find reasons to live. Being able to read into a character by his choice of clothing was pure sartorial genius. I knew this was going to be my main pic for tonight the instant I saw it. One of the best scenes in this drama so far if you ask me. The look on his face perfectly captures all the emotions he is feeling – love, regret, longing, relief, hope, and a little bit of prayer. He was willing this car to keep going at this pace for as long as it could so he could memorize every feature on her face and her smile. He was trying to read if she was happy and content – if she was doing okay without him. I bet this is the one time he really took advantage of her being blind to keep staring over at her. It’s like just seeing her for these few seconds was enough to keep him going for another few days. This is how much she means to him so can you imagine how painful it will be for him to realize how her smile was just a pretext – to mask all her pain and loneliness. Her life before Soo wasn’t great, but now without him, there is too much of a void she knows she can never fill. Enduring the pain from her tumor was one thing, but this ongoing ache in her heart missing Soo was just too much for her. This cab ride wasn’t long enough cuz Soo didn’t get to see the most important thing. He didn’t get to see the truth written on her face – hidden cleverly behind the façade of contentment. I knew Soo fell in love with the right person ever since Young made him feel whole again after a lifetime of events that left holes in his heart. 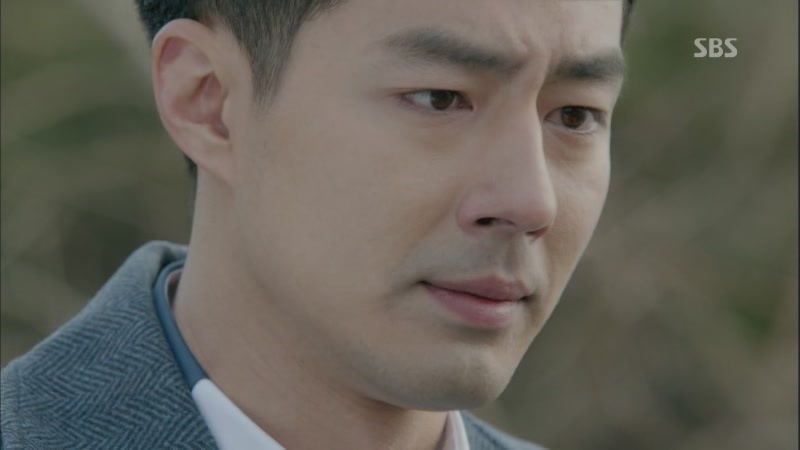 What his mother did, growing up in an orphanage, losing HJ, being framed by Sora, losing the real Oh Soo by having him die like that cuz of him, living an aimless life, and so on – Soo just had too many things in his life go wrong. Young came into his life and started to fill up the cracks and crevices of his broken heart with her warmth, kindness, generosity, devotion, and unrestrained love. From day one he knew he didn’t deserve someone like her, but she showed him that he is a person of worth. That he deserved love and happiness just as much as the next person. When they arrived back at the house, he didn’t want to get out of that car. He knew the minute he stepped into that home, his world would start to crumble and fall apart again. He probably thought he wasn’t strong enough to face saying goodbye, but she made it even harder with her kind words. Before she spoke to him he still had that case full of money in his hand, but after she left him, he came to his senses. He left it behind cuz he took too much from her already. He already stole her faith and trust in people. He took away her will to laugh and be happy. He left her with just the pain of having to grieve for a brother she never got to know. He took enough from her and he wasn’t about to take anything else. Since his words no longer carry any weight, he had to prove that her love meant something to him – even if showing her that cost him his life. I used to think if you cared enough or if it mattered enough, somehow you could make a difference. Then I realized sometimes real life gets in the way of that and takes away your choices and options. The power is out of your hands and the only thing you can do is fight for some semblance of control. By pretending to not have heard the confrontation between Soo and Wang last night, that’s what Young is doing. She really is stronger than most people give her credit for. To hold it together like that and act like nothing happened – that takes some special kind of courage. Who knew that that being the victim in this scenario could be so empowering for her. She is the pawn in all this -being pushed around, used, and told what to do so now she is taking some of that control away from Soo, Wang, and everyone else. She probably thinks everyone knows the truth by now except for her so she really has no one to trust or turn to. I didn’t realize that one of the consequences of this scam would be that Soo is going to rob Young of her trust in people to this extent that she can shut off her emotions and run on auto pilot. It’s hard to imagine just a few weeks ago this is the same girl who broke down in tears in his arms asking if she could trust at least him cuz he is her brother and Soo said yes she could. To her it seems like he lied, but he actually meant every word – even back then and ever since he really did want to be that one person she could count on. That’s the thing about Soo that I wish her intellect would connect with and not just listen to the pain and hurt in her heart- despite all his lies and deceptions, there was a basis of sincerity and truth built up over time. He began to believe his own lies and really did start to love and care for her as a brother should. Right now she can’t trust anything he has said or done and will question his every word and action up to now like in the preview, but once her inquisition is done, she will reach the same conclusion we’ve all known all along: he never meant to hurt her. He would do anything to undo all the choices he made that forced him to commit such a terrible fraud on an innocent girl. More than anything all he wants right now is for her to forgive him so he can go back into her arms. The comforting words she addressed to the other Oh Soo she thought was the con artist, he needs to hear that directed at him this time. Deaths aside, the real tragedy would be if they never get the chance to say to each other: “I’m sorry, please forgive me” or “despite my pain, loving you hasn’t changed.” Only these two know the exact words that can start their healing process – it’s just a matter of who is going to be brave enough to go first and say what needs to be said or being willing to listen to what needs to be heard. *new comment on the bottom cuz I got carried away emotionally so it came out super long. I am beginning to think this writer is sadistic. Every emotion she can wring out of us she is doing that with every word, look, and action among these characters. I keep telling myself she is going to run out of great ideas and scenes sooner or later, but she keeps coming up with even better ones. The woman is G-I-F-T-E-D. 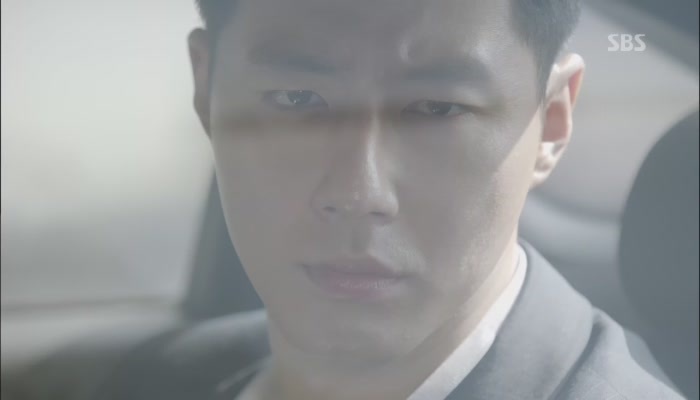 I don’t think it should come as a shock that I bawled like a baby when Soo told Jin Sung that he wanted to live just once as a human being after living his whole life like trash that had been thrown out. It always comes down to that tree and being abandoned as a baby. That scar just won’t subside no matter how hard he tries to repress it. Even now when he is faced with someone who can love him for who he is and not blame him for who he became, he still feels unworthy of her love. All this time I thought Young would be the one who is going to need healing after what Soo and his friends did to her, but now I am realizing that Soo is going to need her love and attention way more. This man has a long way to recovery when it comes to building up his self worth. A great big step in the right direction would be if he gains her forgiveness and she not only accept his love, but cherishes it. That is why that kiss in the cabin is coming at the most opportune time for both of them. It will literally be the most highly anticipated and talked about kiss for years to come. Every episode fills you up. You are full just from all these emotions welling up inside of you. Watching these characters go through so much pain and each one still holding onto some kind of residual hope – no matter how dim it appears, they hang onto every shred of a chance or a possibility. It makes you think about the power of human nature –how sometimes love alone won’t be able to move mountains, but it sure can incite people to do things they never believed they were capable of, to say things they never knew they would ever mean with all their might, and to make personal sacrifices that tears them up inside. This drama is a testament to the beauty that lies within the chaos and confusion – ready to make its presence known. Just like his kiss, it was biding its time till it could no longer be denied. How miraculous is it that Young finally caught up to Soo and now both will have to deal with their feelings for each other. That’s what that kiss did – it leveled the playing field for their love. *it’s not the kiss that is going to take her by surprise – it’s going to be how she feels inside. She is going to know for certain this is what a first kiss should have felt like – with the wave of emotions that come with the perfect kiss from someone who loves her and someone she loves in return. That instinct that it felt right is going to surprise her. It shouldn’t hurt this much to love someone. Young and Soo have reached a point in their relationship where they don’t even need words to comfort each other. All they need is the security of touch and they feel reassured. Just like Young followed her instinct and cradled his head in her arms to comfort him when he told her he forgot about Hee Joo’s memorial, this time Soo got up from his chair and went over to her bedside and did the most natural thing that came to him. He held her close and let his embrace speak for him. I love that she didn’t pull away and just replied with silent tears. As long as he is feeling this much pain at the thought of losing her, I know he won’t ever let her go.